resigned from his post as Town drummer sometime in Spring 1856, as 30th April 1856, Stirling Town Council placed an advert in the Stirling Observer for a replacement Town Drummer, as Isaac had resigned. There is a subsequent sad obituary notice and article, in the same paper (Stirling Observer 20th November 1856) marking Isaac and his wife’s sad loss, as their son Sergeant Major William Spyron of the 42nd Highlanders (the Black Watch) had died while on duty at Stirling Castle. He appeared to have had an “impressive” and eventful military career, and “engaged in foreign service in various parts of the world”. He had only recently been appointed Sergeant Major of the Depot, “forming companies of the 42 nd Regiment in Stirling”, when he died of dysentery shortly after getting a chill at late parade review. His subsequent funeral was held with full military honours, with a cortege procession from the Hospital to the Churchyard on Lady’s Hill. Various local dignitaries in addition to many military personnel attended. Isaac also had three older sons who also served in the army. Isaac’s wife Jane Armstrong died at St. John’s Street, Stirling in 1859, aged 82.
the town drummer—also wearing the royal scarlet—who made public announcements, such as are now notified by the bills abundantly pasted hoardings, blank walls &c. He perambulated the town with, his side drum, halting at suitable intervals to give a roll on it, drawing attention to the notice he was about to call out in his most sonorous tones. Of these an announcement that specially dwells in my memory is one, that in the autumn season was not unfrequently heard, of "a fine field of tatties ready for howkin." The first town drummer I recollect was Wull M'Donald. To him succeeded Isaac Spyron, a retired soldier, who held this office when I went abroad. Quote from the Recollections of Dr G.T. Galbraith. 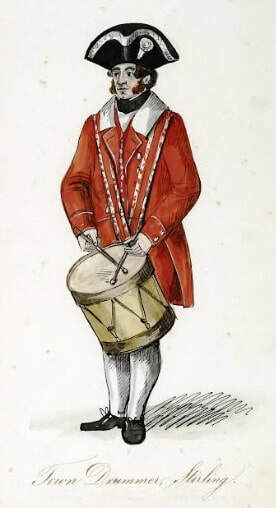 Uniform of the Town Drummer, Stirling Council Archives.